This entry was posted on Friday, September 19th, 2008 at 6:14 pm and is filed under Catmonsters. You can follow any responses to this entry through the RSS 2.0 feed. You can leave a response, or trackback from your own site. 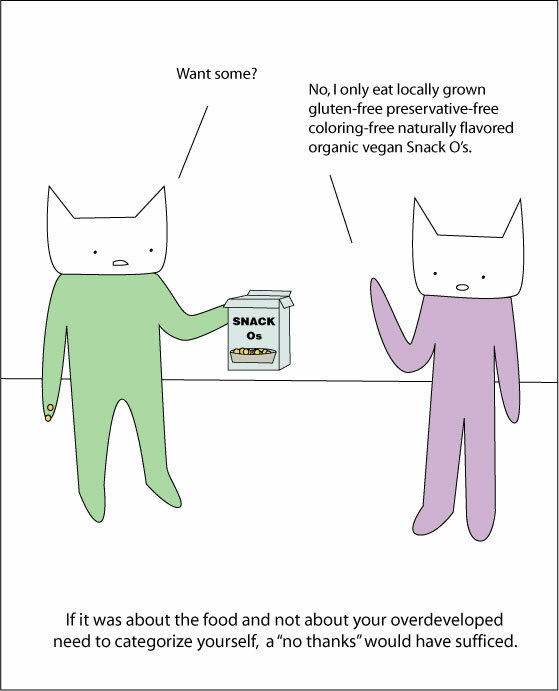 Hehe, it would be funny if the Snack O’s in question actually happened to be all those things! Awkward. We’d find out if Purple Catmonster is actually even hungry. Or what if they had some beet juice for coloring, but were otherwise acceptable. Would they be turned down on grounds of not being “coloring-free”? I see this straw man argument against organic, vegan types a lot. It’s cute, but I wonder why the same criticism can’t be leveled against vocal meat-eaters? They seem to get in your face about their need for bacon or whatever. I guess it’s patriotic to eat meat is hard to label them as whiny douchebags. I don’t think what is being parodied here is the choice to eat those kinds of foods, but rather the fact that a majority of them who do, purposely go out of their way to make it known to those around them; stating that it can almost be considered a fad to some because of such vocal (vain)endorsements. I’m all for this kind of stuff, but I’m the broke 19 year old whose meals are at 1am for less than a dollar at taco bell… Last I checked, while slightly healthier and morally cleansing, it isn’t cheap! So in closing, it shouldn’t be about what you’re known for, but rather just for yourself and the sake of food, going out of your way to put others down when saying no just shows vanity. No, I only eat bacon-laden, beef-fortified, animal-successive Snack O’s. Rawr!